Fresh from Distributed Proofreaders comes another Mrs. Alex. 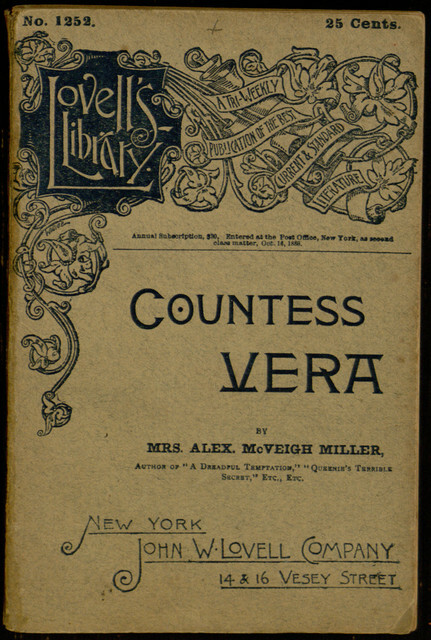 McVeigh Miller novel in eBook form: Countess Vera; or, The Oath of Vengeance, a tale first serialized in the New York Family Story Paper in October, 1882 and later published as part of Lovell’s Library. Like the earlier The Rose and the Lily, this melodramatic story is written entirely in the present tense, and like many of Mrs. Miller’s novels, it deals with themes of premature burial and revenge (in addition to the perhaps more expected romance). 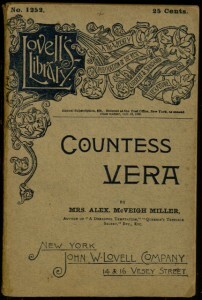 The Lovell’s Library edition used as the basis for the new eBook also includes a short story called “The Mysterious Beauty,” dealing with the misadventures of an Englishman who travels overseas with a niece in order to improve his health. This “filler” story is almost certainly not written by Mrs. Miller and most likely was taken from some British periodical. However, at this time, an earlier source has not yet been identified. The entire book may be read online or downloaded at Project Gutenberg.